Hope you all enjoyed your Easter and your yummy chocolate bunnies! Here’s the Cupcake Nail Art I wore over the holiday. Warning: it’ll probably give you cavities. Hands down the girliest manicure I’ve ever done. When I saw missglamorazzi’s nail tutorial on YouTube last month, I wanted to try it. But it was only when a Swatch And Learn reader, Alaeis, posted pretty swatches on her blog that really made me want to try my hand at it. 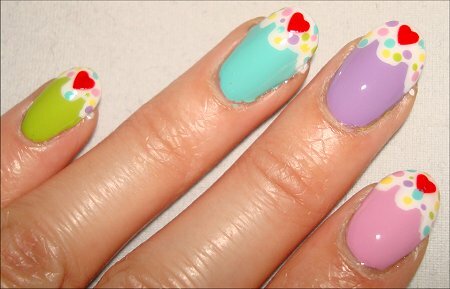 I decided to put my own spin on cupcake nails by using hearts instead of the ‘cherry’. Also, I wanted my frosting to look like it was drippy and gooey. This was my first time creating this look and my first time using a dotting tool or nail sequins. I had so much fun! You’ll need 5 different base colors (1 for each nail) and a good white creme nail polish. Don’t have a dotting tool? Using a toothpick gets the job done. And if you don’t have nail sequins handy, consider picking out a shimmery red nail polish – you can just draw on the heart freehand. Or you could do what missglamorazzi did and paint on a circle for a ‘cherry’. Make sure you prep your nails with a good base coat. Then apply what you’ve chosen for the base colors. I used 2 coats for each color, but use as many as you need to get an opaque finish. I didn’t paint the frosting on the same way as missglamorazzi because I wanted my frosting to look like it was dripping. You can fill in the area in between the 3 strokes to make the frosting more ‘drippy’ and sloppy like I did. If your white isn’t that opaque, I suggest going over the frosting a second time. You really want this to be as white and as bright as possible so that the sprinkles will show up better. This is the first time I’ve ever applied nail sequins, so it may not be right, but this is what I did and it worked. If your nails are curved like mine, don’t worry about getting the sequin perfectly flat. As long as you anchor it with top coat and ‘glue’ it there, you’ll be good to go. Create your dots by dipping your dotting tool into the polish and covering each nail’s frosting. 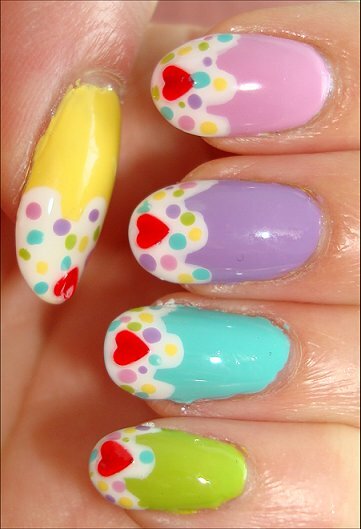 Put the colors in a random location on each nail – it just makes it look cuter. I used Seche Vite Dry Fast Top Coat because I hate waiting for polish to dry, and also because I like how shiny it makes my nails. It’s vital to use a top coat at this point because you want to ‘cement’ your sequins in place for maximum wear. Step 7: Don’t Bite Your Nails No Matter How Delicious They Look! So there you have it. It wasn’t hard at all. This was the first time I’ve ever done nail art with freehand painting (i.e. no nail stamping like Konad or Bundle Monster)! So, if I say it’s easy and I can do it, you’ll be able to do it easily, too! Want to see how missglamorazzi did it? 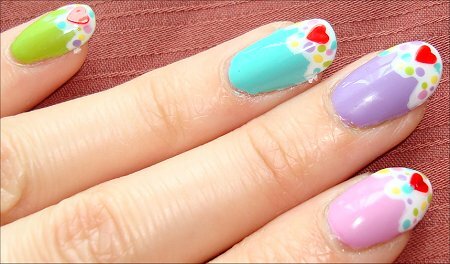 Check out her cupcake nail tutorial here! Also, check out how Alaeis’ cupcake nails turned out! So cute! 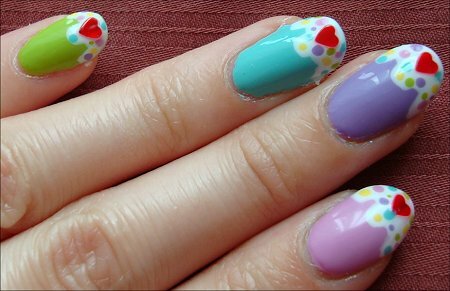 What manicure did you wear for the Easter holiday? 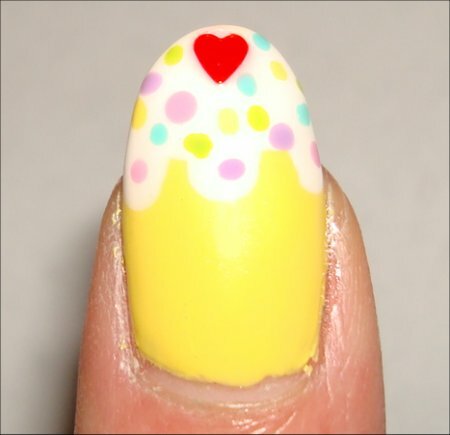 Would you try recreating these cupcake nails? What was your favorite nail art that you ever did yourself? Please share! This entry was posted in Nail Art, Nail Polish Swatches & Reviews, Product Reviews, Tutorials & Tips and tagged China Glaze, Cinapro, Nicole by OPI, OPI, Orly on April 26, 2011 by Mary S.. 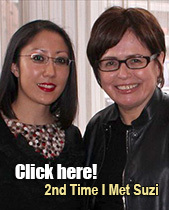 When you try it, please come back and share it – I’d love to see where your creativity takes you! That’s the beauty of a DIY manicure – everyone puts their unique stamp on it so they don’t look identical. Is there any specific nail art that you’d like to see me try on Swatch And Learn? Thank you for showing me the lovely manicure you came up with. 🙂 I may have forgotten that I wanted to try this otherwise. Are you planning to do any other nail art? Have you seen any cool new nail tutorials? I’ve got a few more nail-art ideas for upcoming manicures, but I’ll need to buy nail-art brushes first and test it out on a few nails. There are some amazing tutorials from Bubz for strawberry and bubblebee nails, they’re sooooo cute. 😀 But I need some tools as well and a couple of polishes, too. Oh, those sound like something I’d want to try. Also am interested in doing watermelon nails and maybe little fish on each nail. I had red round sequins, but thought I’d go all out with hearts. 🙂 Thank you for commenting! Although Fiona and I blog because we really enjoy sharing our opinions with everyone, we really appreciate feedback from our readers! 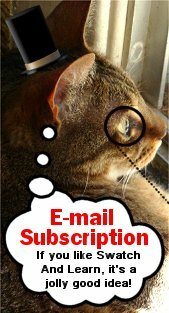 It makes blogging really fun and engaging. Love to hear what others think, whether it’s good or bad. Kinda steers us in the right direction. I love the colours, and the nail art looks great! May I ask where you bought your dotting tool? I haven’t seen any at Sally’s, and have been wanting one for a long time! Thanks! Thanks! 🙂 I had a blast doing it, and it was hard when I went to remove it because I enjoyed having cupcakes on my nails so much. sooooooooo cute! Im totally doing this for my blog! imfeelingnailventurous recently posted: Check this out!!! I won my first giveaway! Oh wow…lovely!!! I’m going to try this out!